It’s been quite a busy Easter season here over the past week! We kicked things off on Palm Sunday with a performance of Swamiji’s oratorio, Christ Lives. 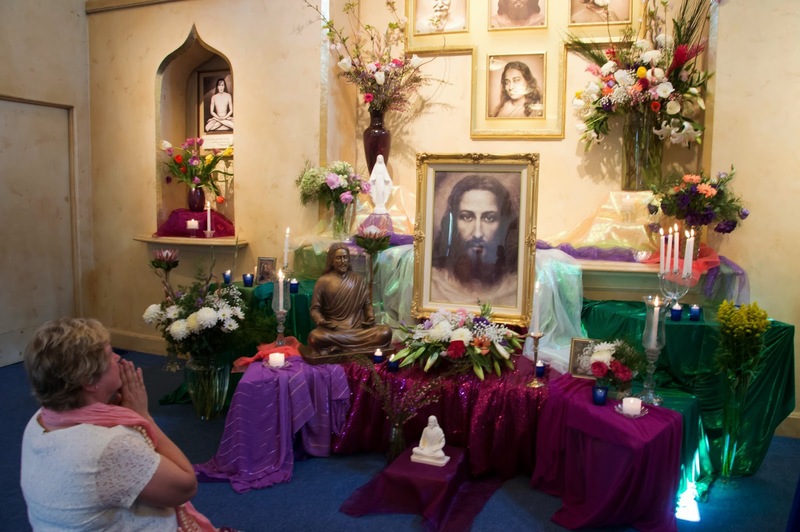 The oratorio has long since evolved beyond a mere concert, into a profound experience of attunement—attunement with Swamiji, with Jesus, with the meaning of Easter. The choir was at its finest, we had a wide range of new and returning soloists, and as a special treat, Chaitanya came down from Sacramento to conduct. If you’d like to relive it, you can download a recording (one long track, or individual songs). We have new microphones now that record at a much better quality, much closer to what one actually hears in the audience. 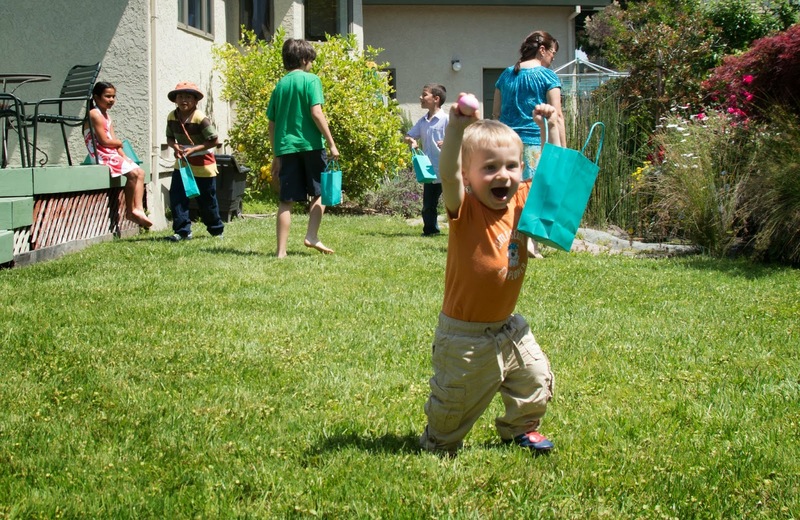 Though Easter was now over, we still had one more important, new occasion to come together for. Monday, April 21st, was the first anniversary of Swami Kriyananda’s passing. Master had told Swamiji as a young monk that he would find God—and final liberation, or moksha—at the end of his life. Swami got there by devoting his life to serving Master and helping all of us progress along that same path. 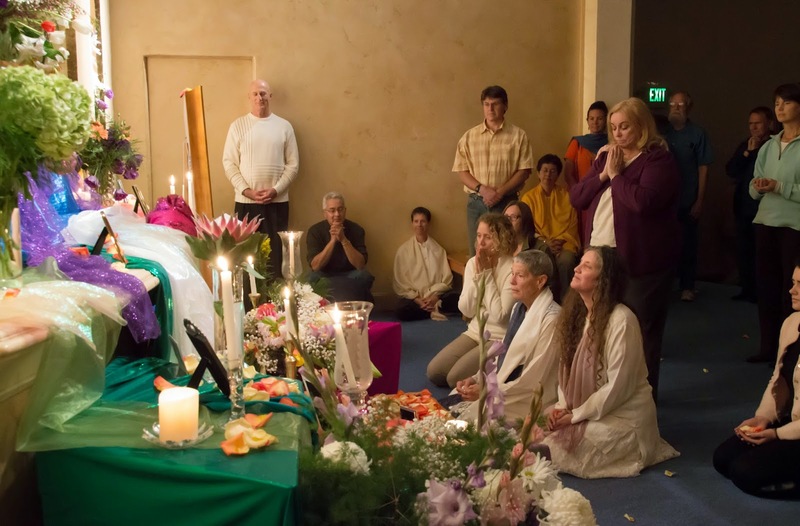 We held a special service honoring him for this, and the evening included a beautiful slideshow composed entirely of photos of Swami, and selections of his music. We ended by offering rose petals at the altar, among all the photos of Swamiji, in a mood so sweet and intimate that no one wanted to leave. 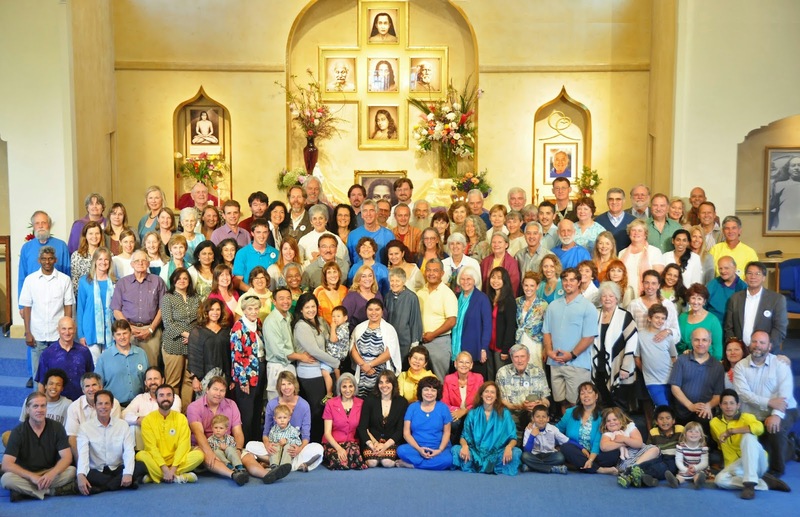 It was a very loving tribute to the man who made all our spiritual lives possible through Ananda. A few photos from Monday are here. Asha also gave a webinar that morning, titled “Remembering Swami Kriyananda.” You can watch the recording of it here. Guest post by Amy M. Photos here. Add in singing “O God Beautiful” at the stream, playing nature games along the hillside walk, and you have a small taste of the imaginative and soul-full offerings that Saiganesh and Vinny provided for us on Saturday’s nature hike in the Sunol Wilderness Area. We left our cellular reception behind and entered into the realm of Divine Mother, in her springtime finest. Poppies, lupine and other wildflowers abounded. The area named “Little Yosemite” lived up to its name, with huge boulders to climb and scamper on while the river rushed around them, especially swollen by the previous week’s rain. The nature games—including some of Bharat’s and new ones inspired by John Muir—helped us to connect to a lineage of reverence for nature, for humankind’s integral placement within nature, and for how nature always gives us more than we expect. We stopped for snacks, for meditation, for game-playing, for expansive views, to let other hikers pass, and just to marvel in the play and beauty of God’s wondrous creation… beyond all imagination of expectancy! 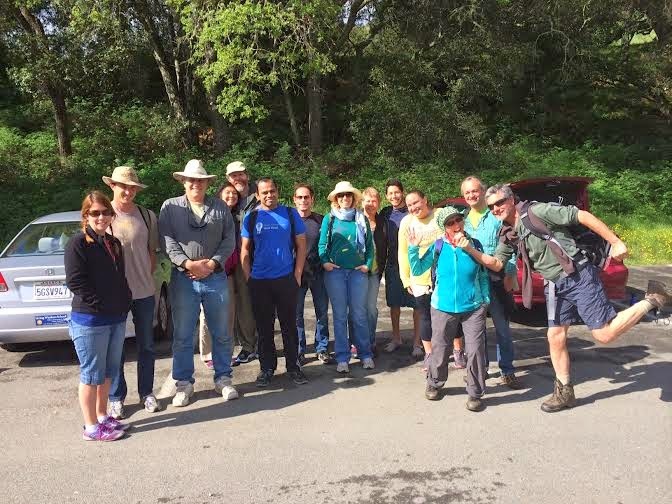 More hikes coming up on May 31st and August 9th!